Last weekend, for Sunday Supper, I made the best ham I have ever had in my life! Seriously, if y’all are looking for a good ham recipe for Easter, You have to check out Mary’s Brown Sugar and Mustard Glazed Ham over at Deep South Dish. Mine didn’t turn out nearly as pretty as hers, but it sure was delicious! With the ham, we had a big ole pot of Southern Style Green Beans and this German Potato Salad. German Potato Salad is on my very short list of favorite sides. It is so yummy and a really easy recipe! It also makes a great side to take to a potluck, because it is great warm or room temperature. Give it a try and let me know what y’all think! Add the Potatoes to a pot with lots of water. Bring to a boil and reduce down to a simmer for 20 minutes, or until fork tender. Drain and reserve potatoes. Heat a large saute pan and add the bacon and cook until bacon is EXTRA crispy. Remove bacon and all but 2 TBSP of the bacon drippings. Set bacon aside to drain on paper towels. Add the diced onion to the remaining 2 TBSP of bacon drippings in the pan and cook until they are soft, about 7 or 8 minutes. Add the Chicken Broth, Apple cider Vinegar, Salt & Pepper. Toss the potatoes in and cook until the liquid has absorbed into the potatoes. Sprinkle with Chives and serve warm or at room temperature. Apple cider vinegar in potatoes? Count me in! This looks great, I love a good potato salad! 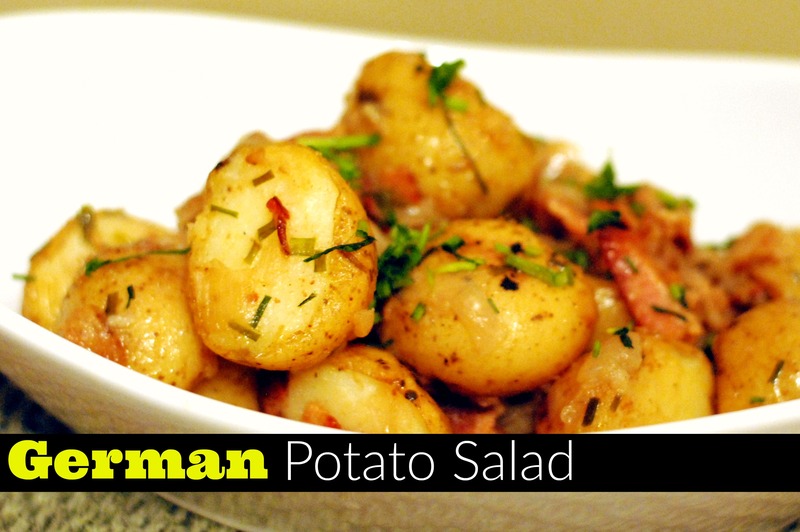 I love German Potato Salad…gonna have to try this one!